Depression is a disorder that causes a person to feel continuously sad and hopeless. Depression can affect anyone at any age, including menopausal women. However, depression in older people is often written off or ignored. Depression should not be a normal part of aging or menopause, and treatment should be sought if a person is suffering from depression. What Is Fatigue and How Is it Connected to Menopause? Fatigue can have a range of causes, such as being a symptom of depression. Older people experience depression and the symptoms that go along with depression differently than other age groups. Fatigue and depression are two of the several psychological symptoms of menopause that women can experience. It can be hard to figure out what exactly is causing fatigue and depression in menopausal women. Part of it may be due to hormonal fluctuations, but lifestyle factors and other parts of a woman's life can also trigger fatigue and depression during menopause. Fatigue is not the same thing as just being tired or sleepy, although feeling tired or sleepy can be a part of being fatigued. Fatigue is characterized by feelings of exhaustion, disinterest, and being worn-down. Fatigue is often connected to depression or another underlying medical condition. Some symptoms of menopause, such as night sweats, can cause a woman to have disrupted sleep, which may lead to fatigue. Women are also at a higher risk for mood swings, anxiety, and other mental health problems during menopause, and these things can lead to depression. There are also many aspects of a woman's life, such as the death of a loved one, stress at work, relationship problems, or another problem, that may increase a woman's risk for depression. How Can I Overcome Fatigue and Depression? 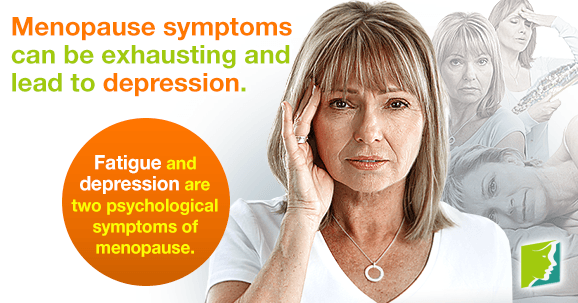 Fatigue and depression should not be a regular and accepted part of aging or menopause. Help is available, and it is important to reach out for help before depressed feelings and fatigue become overwhelming. Think about joining a support group, either in-person or online, calling a helpline, or talking to a therapist or someone in your life that you can trust.